Few students of the Indian Motorcycle would be very familiar with Model 841. A transverse 750cc side-valve 90 degree V-twin the Indian 841 was a unique machine for this prolific American company. Brought into existence by the exigencies of war the 841 was an attempt to capture lucrative War Department contracts for an all-purpose motorcycle. 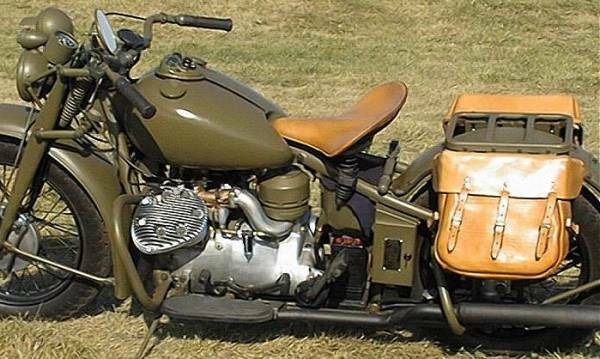 Based loosely upon captured German all-terrain sidecar outfits the Indian took a different tack from the popular boxer flat-twin and set the motor across the frame in a 90 degree vee, much like the Moto Guzzi of today. With a duplex cradle frame, girder forks, plunger rear suspension the 841 ran a 4 speed gearbox with foot change and a shaft final drive. The engine was greatly under-stressed designed for a top speed of 110km/h. The bike itself turned out to be a pleasure to ride and if not for the war could have had a promising civilian life. Unfortunately it did not turn out to be. The Jeep arrived and it was not long before the cheap and easy to produce car destroyed the hopes of any motorcycle manufacturer. 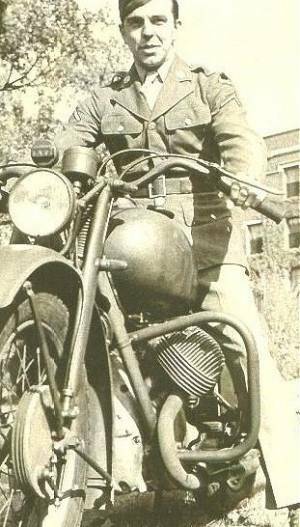 The Jeep could carry more men and equipment, tow a trailer and travel almost anywhere and the War Department soon saw the advantage of a utilitarian car over a motorcycle in this regard. Only a thousand Indian 841s were built before the contract was terminated. Most went into storage and after the war most were civilianised and sold to the general public for a song. Indian never went back into production of the 841, which was more of a pity as trying to compete directly with Harley Davidson in the post-war market the company soon went down the gurgler. Who knows a sporty upmarket Indian “le Mans” might have saved their bacon?